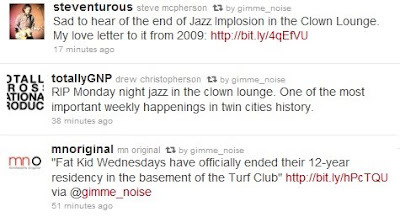 More news coming in via Twitter on the continuing drama of the Turf Club management changes: improvisational jazz group Fat Kid Wednesdays is officially ending their 12-year Monday night Jazz Implosion residency at the Turf's basement Clown Lounge. 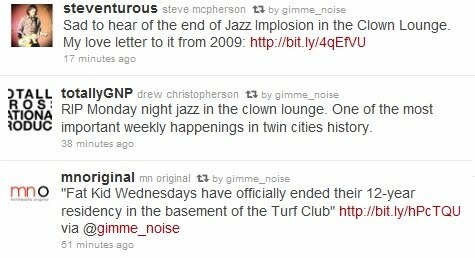 The decision probably has something to do with the fact the Turf will no longer be open on Sundays and Mondays, according to Gimme Noise's interview with new manager Josh James. UPDATE: Punk poet Paul D has confirmed to us that his long-running Riot Act Reading Series (typically held once a month on Sunday at the Turf) will be canceled/relocated as well. Lame! I still have no idea what's going to happen to Trash Film Debauchery which was on Monday's as well.